The lymph node ratio (LNR) and log odds of positive lymph nodes (LODDS) have been proposed to minimize the stage migration phenomenon. The value of the LODDS and LNR staging systems to predict and discriminate prognosis was assessed and compared to the International Union Against Cancer (UICC) TNM classification (pN). Three hundred and twenty-six patients with gastric carcinoma were retrospectively studied. Disease-specific survival rates were calculated for every pN, LNR, and LODDS category. 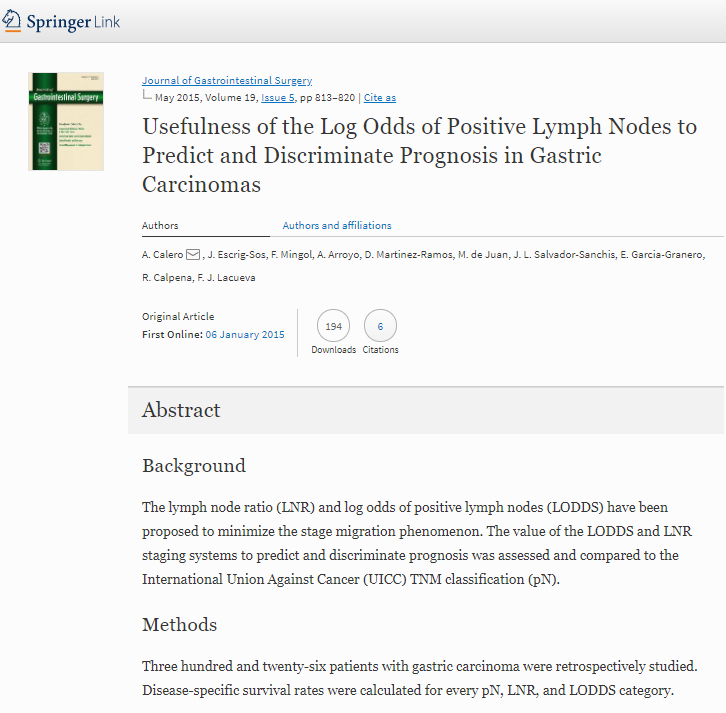 The LODDS staging system was superior to the pN classification and LNR system to discriminate risk prognosis especially in patients with an insufficient number of retrieved lymph nodes.